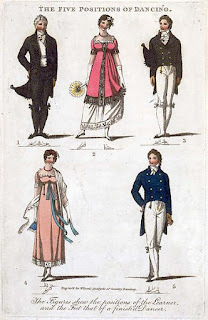 So far, for my Regency-style costumes, I have gotten patterns for my underthings, Spencer jacket, and dress from Sensibility.com. And I recently just ordered a corset pattern and a wooden busk from the Mantua Maker's website. I really can't get to work on a dress until I have my corset made up, because the shape will be all wrong if I try and fit my dress without the corset. It's been quite the project to rummage around the internet to find all the bits and pieces required for a period Regency-style look. I'll be compiling a list of links for everything that I've found from period shoes and silk stockings to bonnet-making supplies! That way the resources will be all in one place for myself and for anyone else. As for fabric... I always love being on the hunt for historically accurate fabric. It is especially difficult to find sheer cottons with any color or print on them, let alone them being historically accurate. I went to the fabric store yesterday, not intending to get anything, but I was especially diverted by this gorgeous rust-colored 100% linen and a deliciously smooth, lightweight white cotton/linen blend. I'm thinking of using the blend for some underthings and the rust-colored linen for a Spencer jacket which will go nicely with my white cotton print I'm planning on making up into a dress. I was also very tickled to find a roll of black cotton velveteen laying forlornly and almost lost underneath the acetate velvets. If only they had another color besides black! 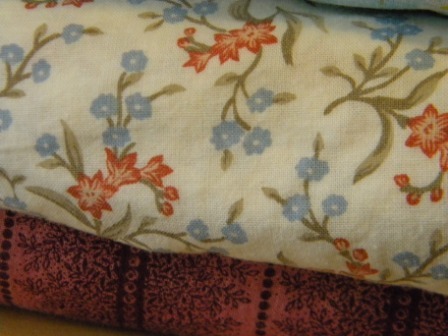 The linen is about the same exact color as those rust-colored flowers. Both are recycled fabrics from some of my Civil War gowns. 4 1/2 yards of skirt fabric goes a long way for Regency-era dresses. Now all I need is a bonnet pattern and supplies! I'm still deciding on a style. It's hard to know which style will look nice on me. Jennifer over at HistoricalSewing.com suggests making a mocked-up version of the bonnet out of plain white poster board, which I think is a fabulous idea!